Ah, Madrona. This was my fifth time to attend this very fun fiber festival in Tacoma. And sadly, my last. After years of putting it on, the organizers decided to retire. I’ll miss this annual jaunt to Washington. Will have to find another place to hone my knitting skills. I always try to take a class that pushes me outside my comfortable little knitting box. The first year it was color theory and stranded colorwork. Then came Eeks Steeks with Mary Scott Huff. So fun to take scissors to your knitting. Really! 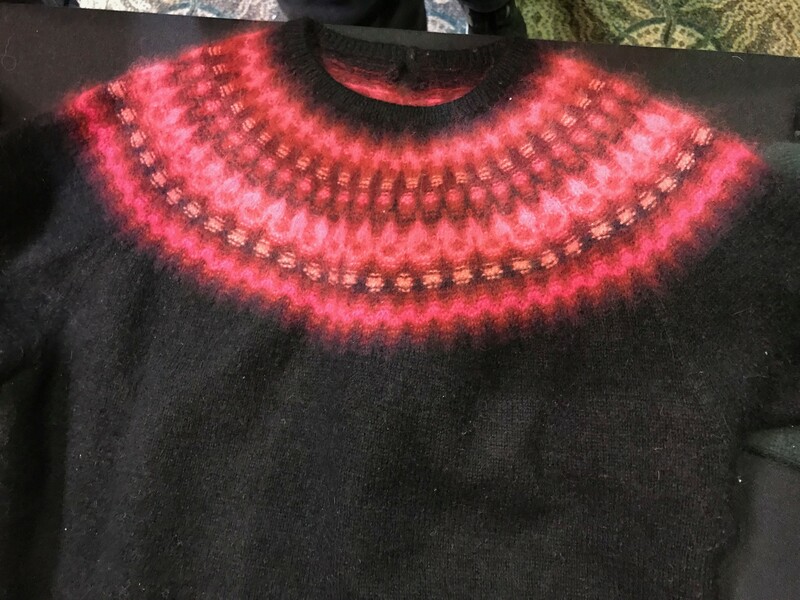 A mini version of the Haapsula shawl with Nancy Bush, sock theory with Cat Bordhi, and Norwegian sweater class – all exciting classes that had me come away with a new skill and some fabulous insight into the history of knitting. Last year introduced me to double and triple ought needles as I learned the history of and how to create a pair of Scottish Sanquar gloves. While a tad bit tedious (as well as very slow progress with those itty bitty needles), the end result was beautiful stitch definition. There is an upside to everything in knitting, right? This year I lucked out again. 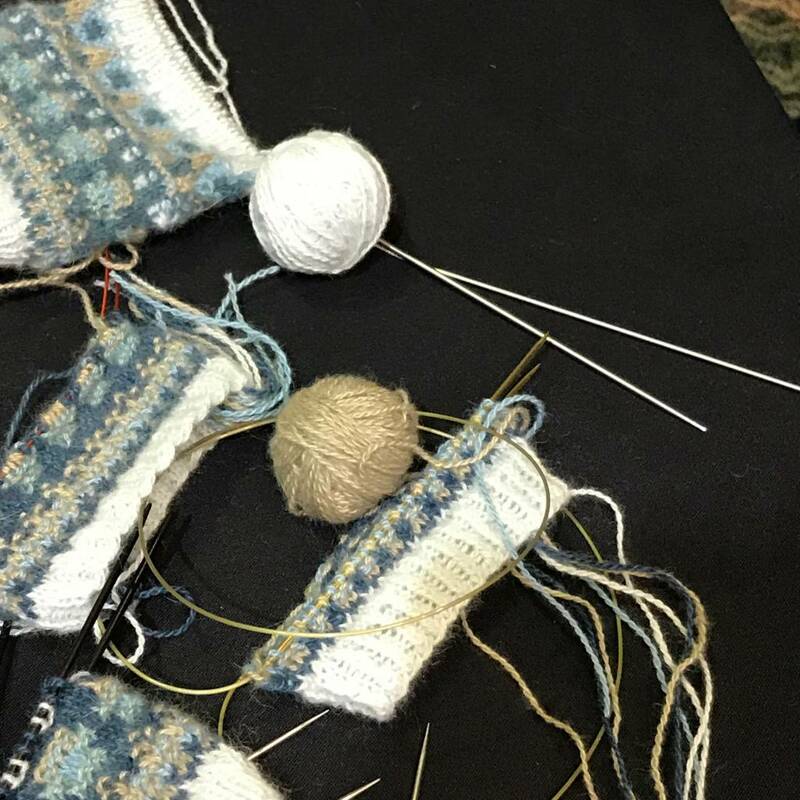 For several years, I’ve tried to get into Susanna Hansson’s incredibly popular Bohus Stickning class, always ending up on the wait list. With this year’s kerfuffle surrounding registration (a whole other story involving dogs, pajamas, and waiting anxiously for the registration system to uncrash), I once again found myself at the top of the dreaded wait list. Argh! But as luck would have it, I made it in. And boy oh boy, was it worth it. If you don’t know anything about Bohus Stickning, I urge you to get online and research a little. A fabulous effort in Sweden, Bohus Stickning was a knitting cooperative active between 1939 and 1969. It was established as a cottage industry to provide income for poor families in Bohuslan (Sweden) during the Great Depression. Couture knitwear designed by the founder Emma Jacobsson and other designers was handknit by women in Bohuslan Province and sold to high end department stores (ie – Niemann Marcus, I Magnum) and fashion houses both in Sweden and internationally, fetching prices upwards of $2500. The effort not only provided us with some gorgeous sweater designs, it launched women into the work force, making a genuine social impact on women in society. The history behind Bohus Stickning was fascinating. The knitting was a blast, too. We each got a lovely little wristlet kit to practice the techniques used. A very special yarn only sold in Sweden, the sweaters were knit with a fine gauge angora merino blend. Yummy! Color stranded, with added texture created by interspersed purls, my wristlets are knit on US 00 needles. Others in the class admitted they weren’t fans of tiny needles (my friend Michele says she refuses to knit with anything smaller than a US 1- she’s perfectly happy with big wristlets), but I actually enjoyed the little guys, and really like the finished product. The pattern we followed was a Bohus classic – Blue Shimmer. I’ve nearly finished one wristlet. Actually, I ordered some more yarn so as to make mine into mittens. Ooo, aah – angora mittens! And I’m seriously considering ordering a sweater kit. Susanna not only shared the history and knitting techniques used, but she brought her collection of original Bohus pieces for us to ogle. With white gloved hands, we all got to get up close and personal with these vintage masterpieces. I fell in love with New Azalea – a black and (of course) pink yoked sweater. And wouldn’t you know it, there’s a kit available from the Swedish yarn company, Angora Garnet. Black Angora on tiny gauge needles? An entire sweater? Call me crazy!